The tiger at the center of a years-long legal battle between animal rights activists and a Louisiana truck stop owner has died, but the owner’s desire to get another tiger means the fight likely isn’t over. Tony, better known as Tony the Truck Stop Tiger, was euthanized Monday at the age of 17 after suffering from kidney failure. Michael Sandlin, the owner of Tiger Truck Stop in Grosse Tete, acquired Tony when the big cat was 6 months old. He would spend the rest of his life living in an enclosure by the side of the highway. Tony behind the fencing of his truck stop enclosure. The Animal Legal Defense Fund, an animal rights nonprofit, also expressed sadness over Tony’s death but for a different reason. 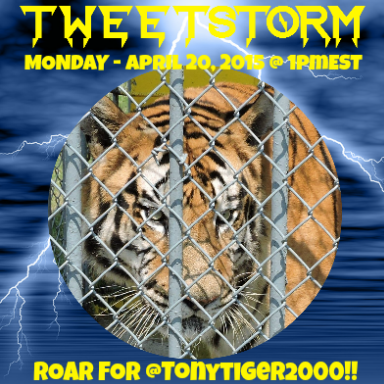 The ALDF tried for more than seven years to get Tony moved to a wildlife sanctuary and said in a statement the group was “devastated” that Tony lived out his final days caged. Sandlin also told The Advocate he plans to try to get a new tiger to live at the truck stop, which is heavily tiger-themed. The ALDF says its staff will do whatever it can to stop that from happening. 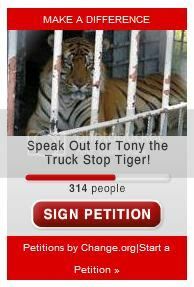 “We’re going to keep fighting and make sure there’s never another Tony,” ALDF attorney Anthony Eliseuson told HuffPost. Sandlin, who did not respond to a request for comment from HuffPost, says Tony received exemplary care at the truck stop. He also argued that the tiger was attached to his human caretakers and was used to life at the truck stop. 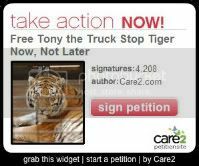 In Sandlin’s view, moving Tony to a sanctuary would have been cruel, since the truck stop was all the big cat had ever known. But animal rights activists disagreed. At a sanctuary, they said, he would have significantly more space, access to a more natural environment and freedom from loud engines and noxious fumes. The question of how Sandlin was able to keep Tony at the truck stop involves a long and complex legal history. In 2006, Louisiana put restrictions on private big cat ownership. In 2012, Eliseuson said, the ALDF won a judgment against Sandlin that invalidated his permit to own Tony. But in 2014, then-Gov. Bobby Jindal (R) signed a bill into law that exempted Sandlin from the big cat ban. However, the 2014 law exempted Sandlin because it decreed that the ban didn’t apply to anyone who owned their animal prior to 2006. That means the exemption would apply only to Tony, not to tigers Sandlin might try to acquire now. So how would Sandlin be able to legally get a new tiger? Eliseuson explained that around the time of the 2012 ruling, Sandlin also filed a lawsuit challenging the 2006 state ban on big cat ownership as “unconstitutional.” His argument was that the law is enforced unevenly and gives officials enforcing it too much power, The New York Times reported in 2013. So far, that lawsuit hasn’t made much progress, according to Eliseuson. But if Sandlin were to win, it would make privately owning exotic big cats legal not only for himself but for anyone in Louisiana. “If he were to ultimately be successful, he would invalidate the big cat ban,” Eliseuson said, adding that ALDF will continue to fight to uphold the constitutionality of the ban. State regulations on owning exotic animals vary wildly, contributing to a situation in which conservationists estimate there are 5,000 to 10,000 captive tigers in the U.S., many in places like roadside zoos and private homes. 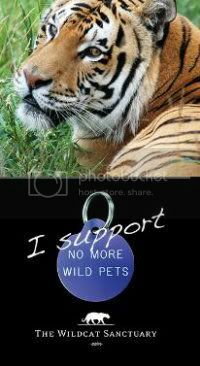 In contrast, there are about 3,200 tigers in the wild worldwide.